My daughter is SO excited about Christmas this year! She is finally old enough to fully understand what is going on. The moment that Thanksgiving was over and I gave her the green light to start getting ready for Christmas, she was all about decorating and making crafts. It’s a great way to entertain her during the day as well and it has really helped to cut back on screen time. Our first official Christmas craft was to make these ornaments for our tree.My mom was visiting for Thanksgiving and helped the kids with this project. It was fun! *Rather than cutting holes in the shapes for twine to hang them, I chose to glue ribbon loops to the back of each one, this way they lay flat and do not twist and turn once hung on the tree. *Because my kids were too impatient to let the paint dry, and then apply glue prior to glitter, we applied the glitter directly to the wet paint, hoping that it would be enough to make the glitter stick. In hind sight, I should have mixed some glue in or used a spray glue after we glittered to really set the glitter prior to hanging, because the glitter is already beginning to come off. Learn from my mistakes! 10 drops cinnamon fragrance oil (more or less depending on personal preference) or cinnamon powder is oil is unavailable. Combine the flour, salt and warm water. Mix until fully combined and dough forms. Add the fragrance oil or cinnamon powder. Nead in. Roll the dough to about 1/4 inch thick (use a lightly floured surface and roller). Cut various shapes using cookie cutters. We found great cookie cutters for $1 each at Sur La Table! Place the shapes on a cookie baking sheet and bake at 250 degrees F for 2.5 hours. Let your child or children have fun painting the shapes with non-toxic paint! Mix in a little glue to help the glitter stick or have an adult apply spray adhesive after the glitter is applied. Apply glitter and voila! Super sparkly shapes! The hardest part will be waiting for these to dry. My son loved checking on them and he kept asking if they were ready to go up. Prior to hanging, glue the twine or ribbon loops onto the back of each ornament. A hot glue gun would be quickest but you can also just use lots of ol’ fashioned Elmer’s Glue. Once dry, hang on your tree and be proud of your work! My daughter loves to bake and help out in the kitchen. While there are lots of hazards, like sharp knives and a hot stove, with some care and education, we’ve had nothing but safe and fun experiences cooking together. Over the weekend, we made sugar cookies. We modified the recipe to make them dairy and soy free so little brother could have a taste too! She measured out all of the ingredients– an exercise in fine motor control. We also counted and talked about fractions of cups so it was a mini-math lesson as well! Once our dough was formed, my job was to roll it flat and hers was to cut shapes or roll small dough balls. Teamwork. While the cookies baked, we whipped up some frosting and partitioned it into several bowls so we could make different colors. She added food coloring to each bowl, counting each drop and talking about what colors we could make if we mixed our food coloring. After frosting the cookies, she decorated each one with sprinkles. Sure, there was flour and other ingredients everywhere, but nothing a quick vacuum and wipe couldn’t take care of. 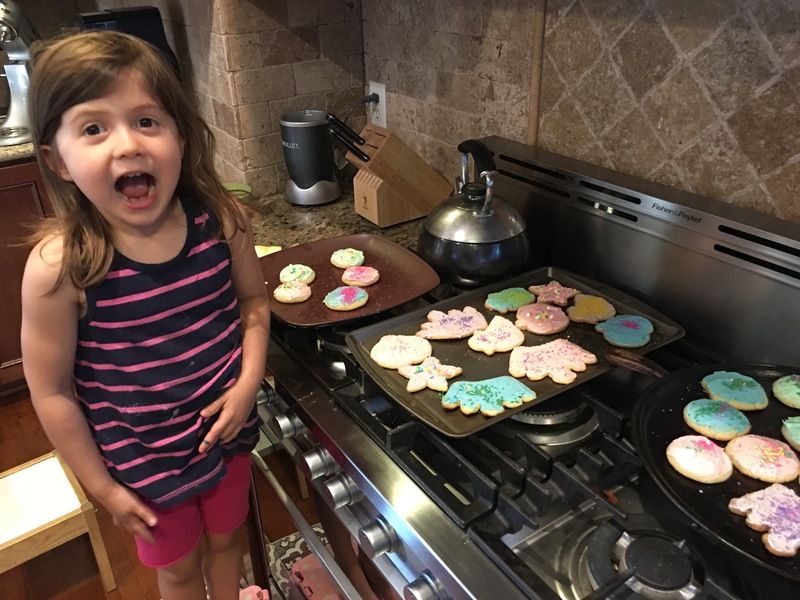 In the end she was so proud of her cookies and the best part was that we had a BBQ to take them to the next day making it so she could only eat a couple and avoid all that sugar!